Customer service is a critical part of the Hyatt hotel chain’s business. Happy customers express their satisfaction in ways that appear on the company’s bottom line. When Hyatt learned that equipping its associates withtabletApple iPad devices to use while interacting with customers significantly improved customer service, the company decided to aggressively expand its tablet the rollout at facilities across the globe. The devices have become an important element in how the company serves customers, enhances overall customer experience and makes its hotel staff more efficient. 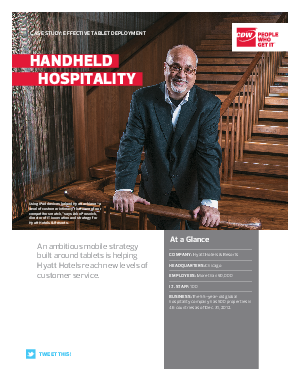 By the end of 2013, tablets and other mobile devices will be mainstays for Hyatt Hotels.